11-Nov-2003 -- We were on a two weeks' vacation in Tunisia with our motorbikes. 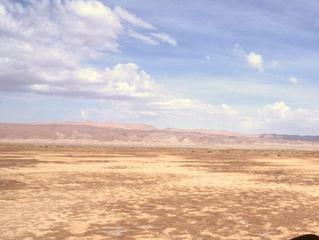 On our way to Douz, we had to cross the Chott el-Fedjadj (chott = mostly dry salt lake). There's a paved road, which crosses the chott from north to south. Coming from north we left the paved road at the northern shore to a gravel road. This road is heading directly towards the Confluence (about 10 km west). About 3 km from the Confluence there's a wind-powered water pump for the camels. Our gravel road was now turning towards south, so we left the road as soon as it got to flat ground (a wet salt and sand mixture, fairly hard). After a short ride cross-country, we reached 34.00°N 9.00°E. To the South, East and West of the Confluence Point only a boring flat brown surface could be seen. To the North we could see a bare hill chain with some grass in the foreground. #1: General view of CP direction north-northeast. #2: Closer view of the ground, towards northwest. #5: Wind-powered pump station (approx. 3 km from CP).